Indianapolis Collected: The Worms crawl in….. This week’s story has all the hallmarks of a classic horror tale. A slaughterhouse. A butcher. An insane asylum. And Coffins with Worms. It all started last Monday, when I got a terse email alert from a stranger. “The killer is inside your house! 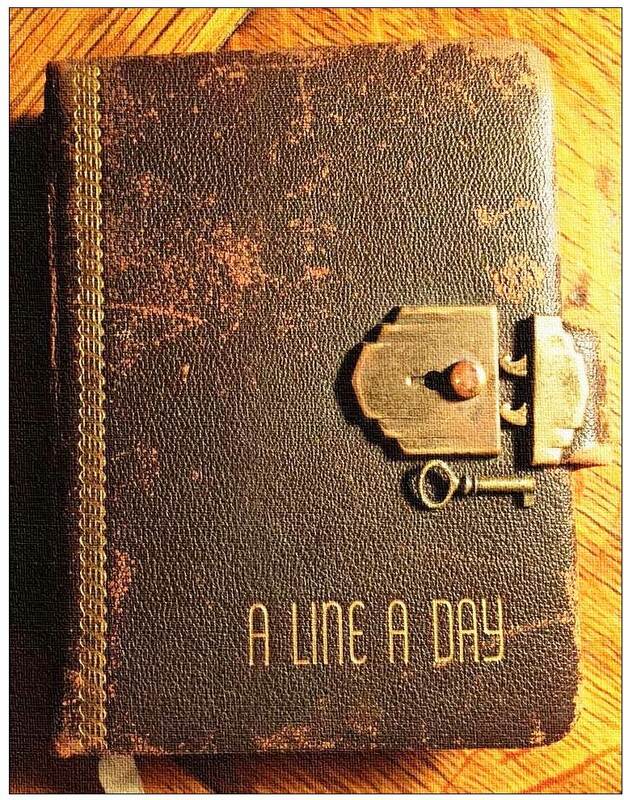 !” it read. Well, not literally. The actual words were far more terrifying. Lard was sold by the bucket in the early 1900s. 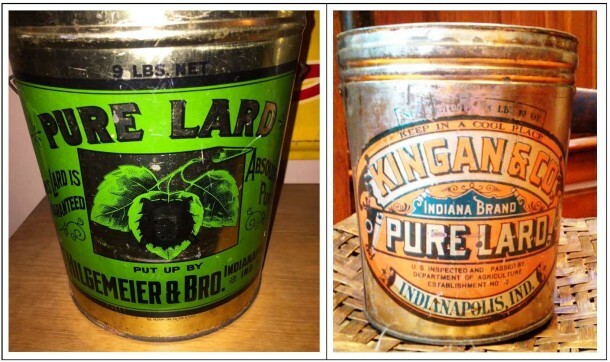 The bucket on the left is from Hilgemeier & Bro. meat packing on the south side. While this scary pronouncement from the World Health Organization made the blood run cold through my bacon-clogged arteries, a century earlier such news could have brought on a heart attack for many Indianapolis residents. 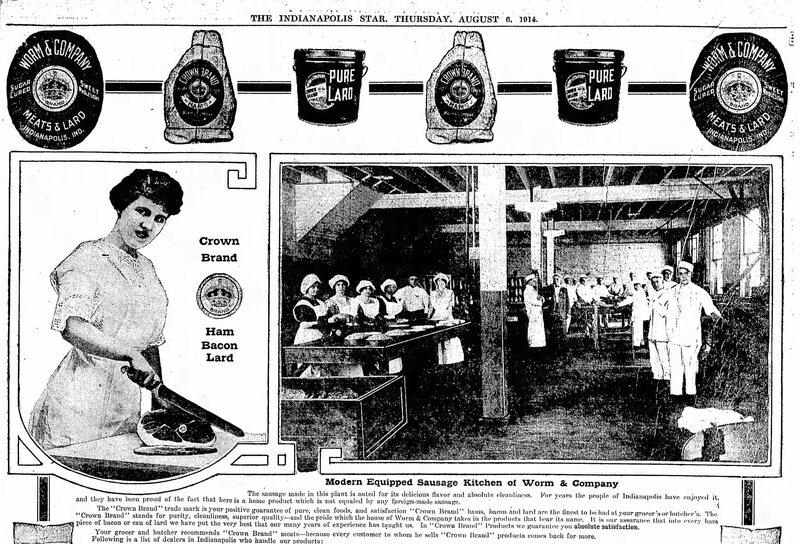 In 1914, the city’s pork packing industry employed 15,000 people at eight different packing houses, And while Kingan’s was the undisputed king, several other slaughter houses also left their bloody mark on the city’s history. The Indianapolis Star, February 22, 1908. Although Albert Worm’s slaughterhouse was near Albert Coffin’s plant, there is no evidence that Worm ever crawled into Coffin’s establishment and played pinochle on his snout. Two of the competing houses in the early 1900s were run by a pair of Alberts – Albert R. Worm and Albert W. Coffin. The plants were almost catty-corner to each other on the near-southwest side, in an area now mostly covered by the interstate. 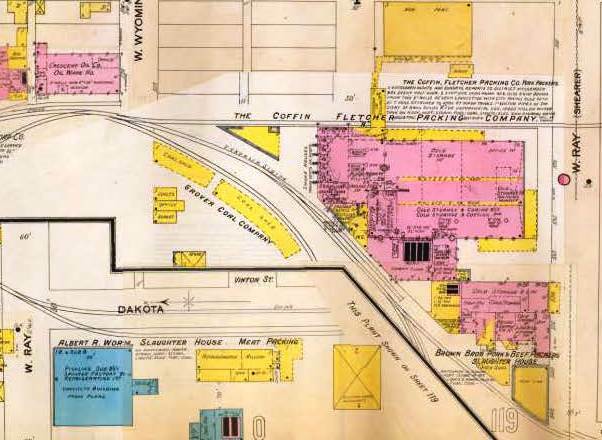 1898 Sanborn map, showing the Coffin-Fletcher Packing Co. in the far right (top) and Albert R. Worm Slaughter House Meat Packing on the far left (bottom). A paperweight featuring the Worm block and Worm’s delivery fleet recently sold on eBay. Worm had a penchant for horses with a solid gray coat and refused to utilize any horses of a different color. Worm’s ambition soon outgrew his small operation on Oliver Avenue. In 1907, he built a slaughterhouse near Dakota and Ray streets on the banks of the White River. Within two years, he announced plans to invest $25,000 in a three-story refrigeration building, with two basement levels. 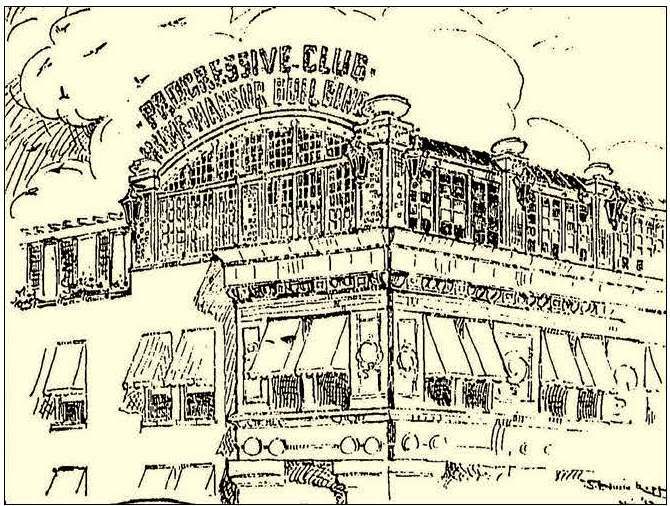 The Worm & Co. packing and slaughterhouse was incorporated in 1911 with $300,000 in capital. A shrewd businessman, Worm realized that consumers would likely reject a processed pork product labeled “Worm Bacon.” So he adopted the “Crown Brand” moniker for his growing product line and touted the cleanliness of his plant in advertisements that featured workers in spotless white uniforms. According to a June 1914 article in The Indianapolis Star, Worm employed a “small army” of men in the work of sanitation. “A visit to this plan will banish forever the vision of the unsanitary packing house,” the Star reported. In 1914, Mayor Joseph Bell may have caused some bad blood among the city’s competing slaughterhouses when he told The Indianapolis Star that there was “nothing better in the morning” than Worm’s sausages and sugar-cured hams. Perhaps stung by the mayor’s failure to endorse his bacon, Worm then launched a promotion that urged every Indianapolis resident to enjoy Crown-brand sliced bacon for breakfast on a particular Wednesday in February. “The proof of the bacon is in the eating,” the advertisements declared. 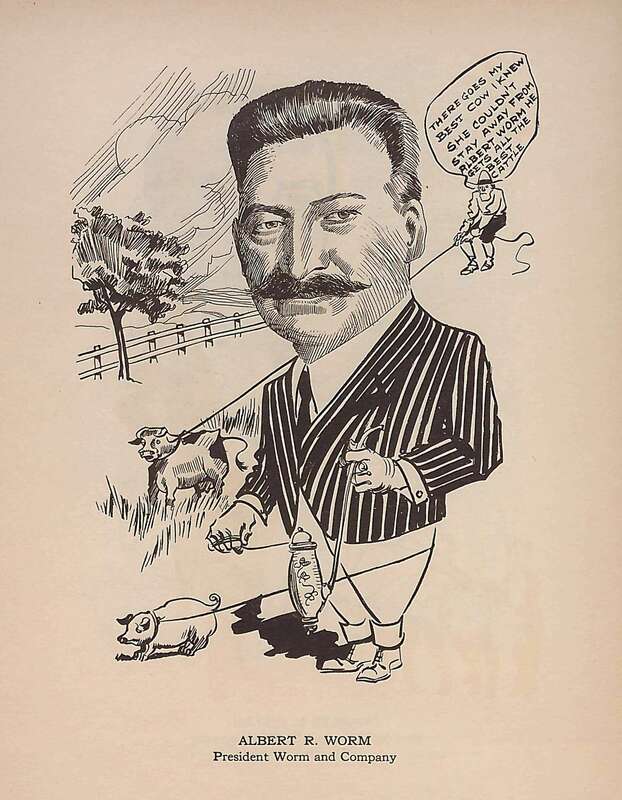 From “Club Men of Indianapolis in Caricature,” 1913. Printed by Roycroft press, the book featured cartoons of prominent local men drawn by the Associated Cartoonists of Indianapolis. Although Albert Worm and his wife were comfortably residing near downtown at 1907 N. Illinois, a disturbing crime occurred at their home in 1913 that may have shaken their faith in urban living. In early May, thieves crept into their yard in the middle of the night and dug up a beautiful magnolia tree that was in full bloom. 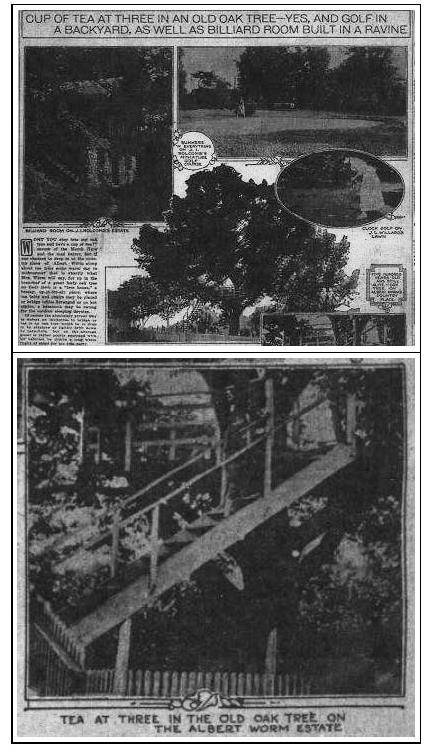 According to The Indianapolis Star, the Worms had planted the tree some five weeks earlier “at considerable expense.” A bicycle patrolman tried to track down the tree by following a trail of fallen petals, but the purloined magnolia was never recovered. 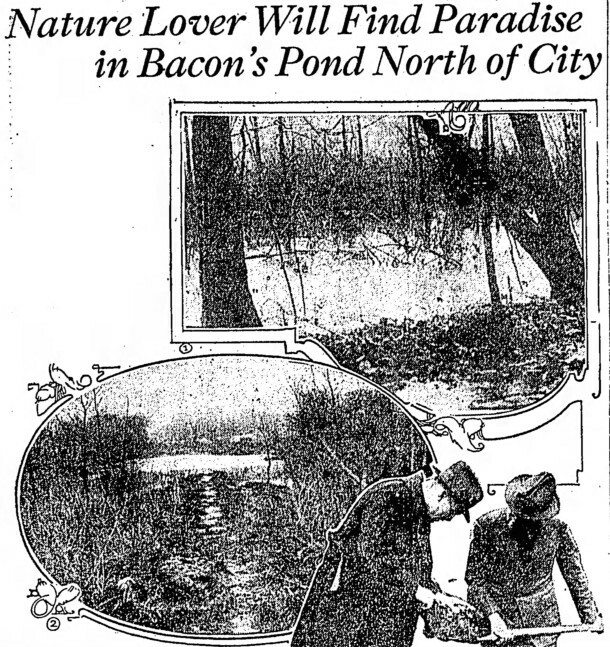 Within two years, the bacon magnate and his family had pulled up their own roots and moved to a country home on Kessler Boulevard that was located adjacent to an area aptly known as “Bacon’s Pond. Among other amenities, the Worms’ handsome new country estate included a massive 500-year-old pin oak tree that was impervious to thievery. Its leafy branches sheltered a large tree house constructed by the home’s previous owner, Walter Goodall. The airy retreat was built for more than child’s play, however. Mrs. Goodall had installed pulleys so that baskets of food could be brought up during bridge games or afternoon tea. Albert Worm lived in the country home until his death in 1944. 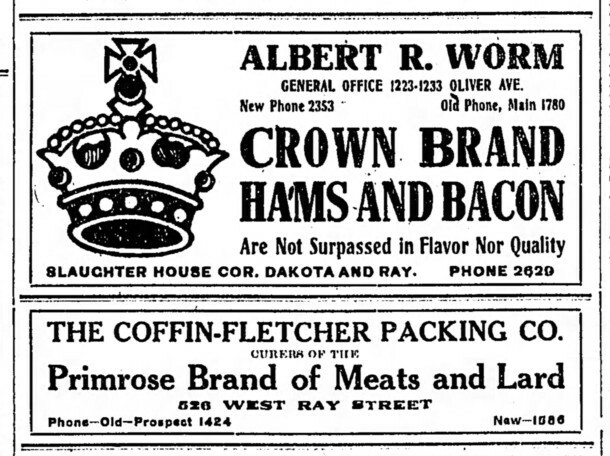 He sold Worm & Company in the early 1920s, but subsequently purchased United Butchers, a former competitor located near Worm’s original processing plant. 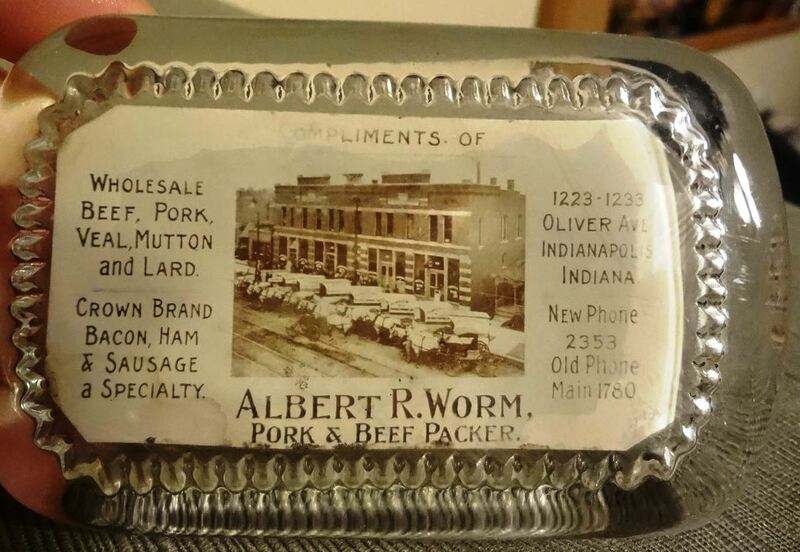 Later, Worm owned and operated another successful slaughterhouse, Indiana Abattoir. The Worm home still stands on Kessler Boulevard between College and Keystone, although most of its original acreage was subdivided in the 1930s into a new neighborhood called “Oak Ridge Estates.” After Albert’s widow died in 1960, the house went to her nephew William Hubert, president of Banquet Milk. His daughter lived in the home until her death in 2013. 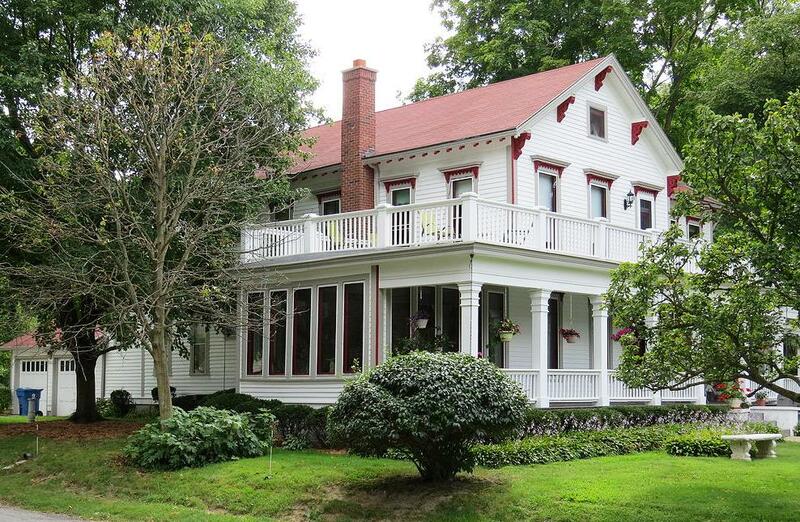 Chances are, you’ve probably turned your head to admire the circa-1880 house while driving on Kessler Boulevard. If so, you may be in luck. The 4,000 square foot house and its nearly 2-acre park-like grounds are currently for sale at a price to be determined by the market. But you’d better hurry, because offers are due at 3 p.m., Monday, November 2nd. As they say, the early bird gets the Worm. 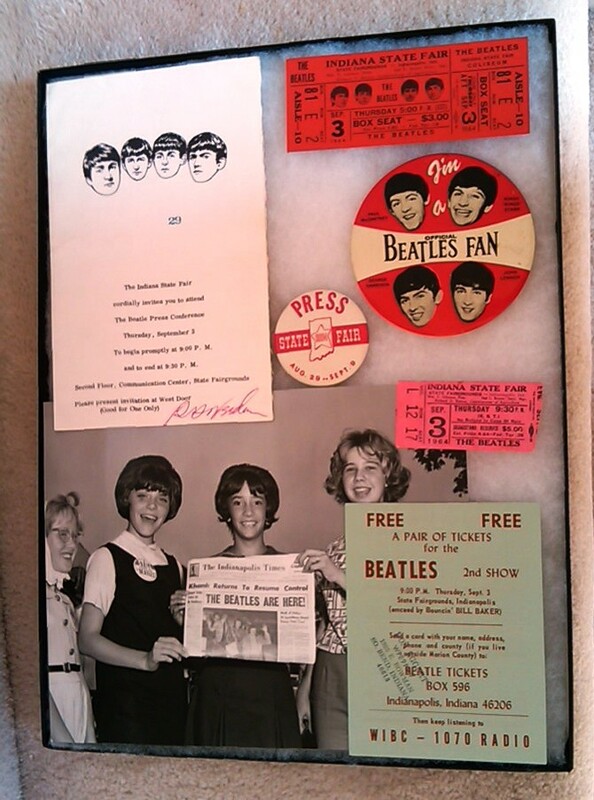 The contents of the home were auctioned in June by Christy’s of Indiana. 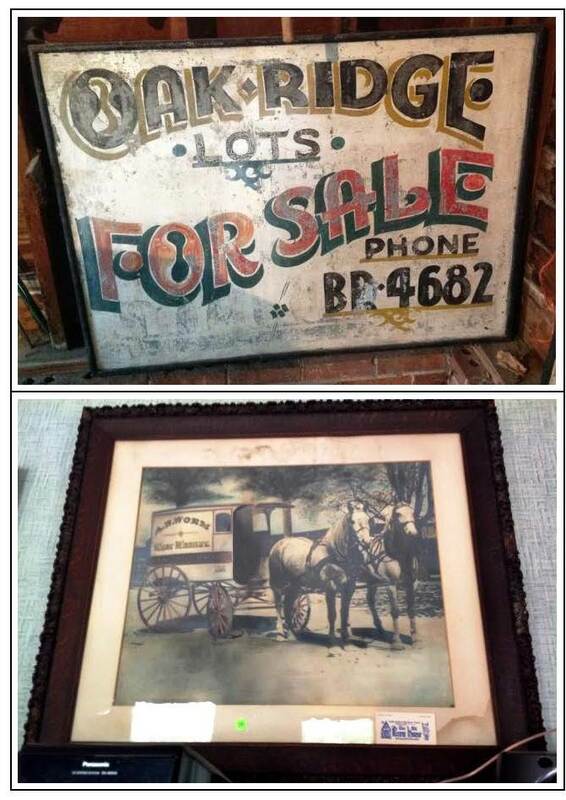 Among the more interesting items offered were a tinted photograph of a Worm delivery wagon and a hand-painted sign advertising lots in Oak Ridge. 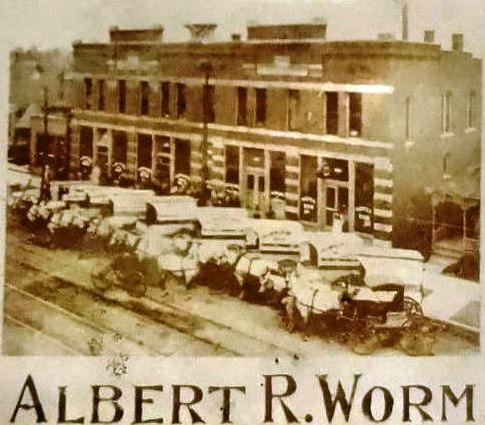 Although Albert Worm and his small packing plants managed to flourish in a market that was increasingly dominated by large, multi-state conglomerates, his old competitor Albert Coffin did not fare as well. 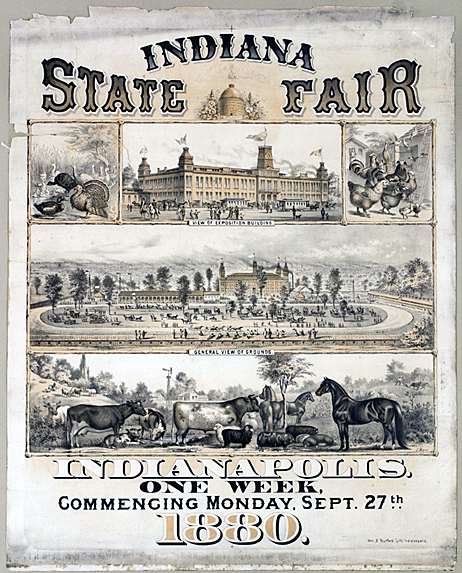 Albert was among the first class of five students to graduate from Indianapolis High School (now Shortridge) in the mid-1860s. He went to work in the family packing business, and in 1888, built a fine Queen Anne home at 1553 Park Avenue. By 1910, the Coffin-Fletcher Packing Company had been in business for nearly 70 years. At its peak, the plant employed 250 men. Although the Coffin home fell into disrepair in the mid-20th century and was later struck by arson, it has been beautifully restored. The undated photo on the left of 1553 Park Avenue is from the files of the Indianapolis Historic Preservation Commission. But the pork industry began to change as federal food laws were adopted and giants like Kingan & Company gobbled up the market. Albert Coffin sold his nearly-new mansion on Park Avenue in 1900 and moved to an older home at 971 N. Delaware. 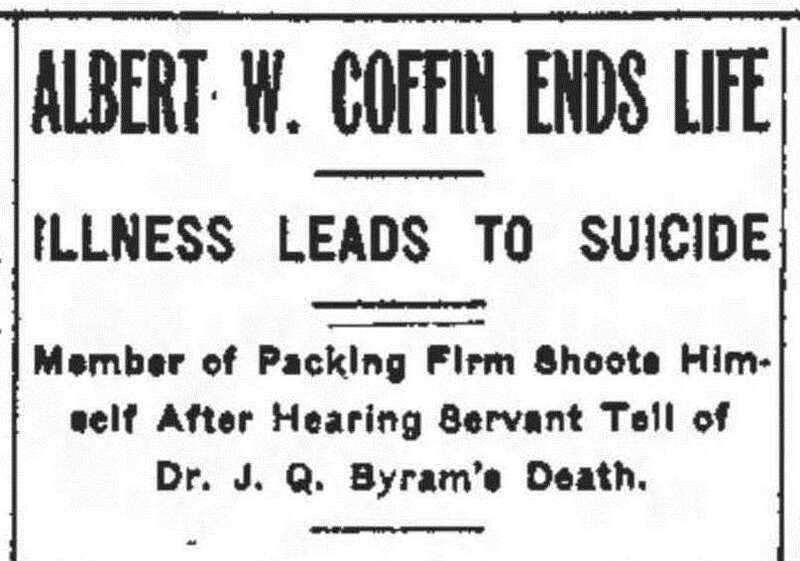 Eight years later, besieged by what his family believed were business worries, Coffin had a nervous breakdown and was hospitalized at Fletcher’s Sanitarium. When his condition worsened, the family sent him to various specialists in the eastern United States, to no avail. By late June 1911, Albert Coffin had lost all hope of recovery. Coffin’s doctors told his family to hide the newspapers and shield him from all business affairs. But on Saturday, July 1, a servant casually mentioned that a prominent local dentist had hung himself in his office. Upon hearing those words, Albert Coffin walked into the parlor, drew the shades, and put a bullet through his head. He was 61 years old. Two years later, his partner Samuel Fletcher sold the Coffin-Fletcher Packing Company to Kingan & Company, which planned to use the aging facility for storage. I was wondering…is the date correct on when William Hubert’s daughter died who succeeded him in living at this home? Here is the direct quote from this article…just wondering…”After Albert’s widow died in 1960, the house went to her nephew William Hubert, the president of Banquet Milk. His daughter lived in the home until her death in 1913″. I’m not trying to nitpick, but the dates threw me off. An excellent article, by the way! You’re right – it’s 2013, not 1913. I’m so last century. No sweat! I catch myself the same way! Thanks! Very informative, as usual. And since you started it, I can’t resist mentioning that Coffin’s coffin has been in Section 4 Lot 7 of Crown Hill since 7/3/1911, and Worm has hopefully been avoiding the worms since 10/27/1944 in his own coffin in Section 73 Lot 316. Poor Dr. Byram is in Section 47 Lot 171. And Hiram Bacon, of Bacon Swamp, is in Section 3 Lot 43. According to J.P. Dunn’s History of Indianapolis, Bacon had a stop on the Underground Railroad on his property, but that would be another possible story.